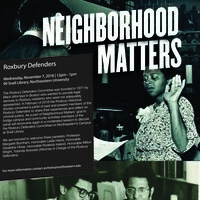 The Roxbury Defenders Committee was founded in 1971 by Black attorneys in Boston who wanted to provide legal services to Roxbury residents who were not adequately represented. In February of 2018, the Roxbury Historical Society convened a panel of past and present members of the Roxbury Defenders to share their experiences and reflect on criminal justice. As a part of Neighborhood Matters’ goal to bridge campus and community activities members of the panel will reconvene again in a moderated session to discuss the Roxbury Defenders Committee on Northeastern’s Campus at Snell Library. Free and open to the public, lunch will be served. Co-sponsored by Northeastern City and Community Affairs, Northeastern Office of Institutional Diversity and Inclusion, Unitarian Universalist Urban Ministry and the Roxbury Historical Society.